Saigon Vietnamese Sandwich Deli is a little more than 500 feet from my beloved Bánh Mì Saigon, literally around the corner. As I mentioned in the review of Paris Sandwich, I wanted to see what the neighborhood had to offer. My first sample of Chinatown’s other offerings left me underwhelmed, but Saigon Vietnamese was another story. To start with, this was a big sandwich. Most bánh mìs are six to eight inches, this one had to be at least ten and a good bit taller than most. Relatively speaking, it was a monster. That said, it wasn’t the size that got me thinking. The #1 House Special at Saigon Vietnamese contains, in addition to the standard vegetables, nem nướng, thịt nguội, and chả lụa. This left me a bit confused, because there’s something a bit off in either the translation here or my understanding of bánh mì fillings. The thịt nguội and chả lụa were what I expected, cold-cut or cold-cut-esque meats previously discussed here and here, respectively. But I understood nem nướng to be pork patties, like I had at Bánh Mì Zớn. Here, though, they were minced. Not just in practice, but described as such on the menu. (The menu, to return briefly to a point made in the Bánh Mì Zớn review, is a series of 8.5×11″ pieces of paper taped above the counter.) Minced and grilled, the pork in this sandwich was much more reminiscent of thịt nướng, as found in my treasured #1 at Bánh Mì Saigon. It had a similarly chewy texture, and very similar sweet, salty, savory flavor. The primary contrast between the two sandwiches is that the pork at Bánh Mì Saigon has a heavier caramelization, and the pork at Saigon Vietnamese is more loose, more moist. Beyond description lies judgement, and I have to tell you that this was a very, very good sandwich. Crisp, tender bread, fresh, bright vegetables, and flavorful, tender meat. Making my way through the sandwich, I was struck with a thought: What if someone likes this better than Bánh Mì Saigon? This is a bánh mì from Bánh Mì Saigon, and it is the best sandwich in America. Now, I have not eaten every sandwich in America, and I do not aspire to. The conclusion that this sandwich is the best was not reached by poll, not by formula, not by proclamation. It simply is. 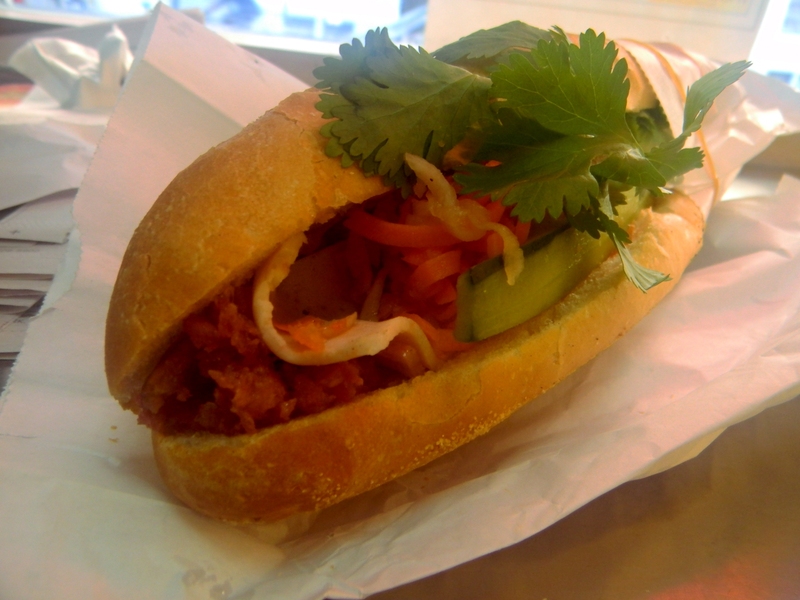 The #1 from Bánh Mì Saigon is not an appeal to reason, it is an argument for sandwiches as a religion. There isn’t much room to walk that praise back. I’m OK with that, I wrote the above because I believed it, because I meant it, because that sandwich showed me something no other sandwich had before or has since. This “what if someone else…” isn’t some act of cognitive dissonance attempting to distance myself from a realization that I might be wrong. My thinking was that Bánh Mì Saigon was better, but if someone valued different things (a moist softness over the celebration of the Maillard reaction that is the #1 at Bánh Mì Saigon, for example) they might feel differently. And that conclusion, that it was possible that the #1 at Bánh Mì Saigon isn’t the best sandwich in the world, was deeply unsettling. It isn’t just that I would have to come before you and offer a mea culpa, or that my entire sense of what a sandwich can be would be thrown off. Both of those things would be true, but it’s more than that. Why that conclusion was unsettling isn’t about me, or even about the sandwiches. It’s about fault lines in the ground upon which we lay the bricks of certainty. 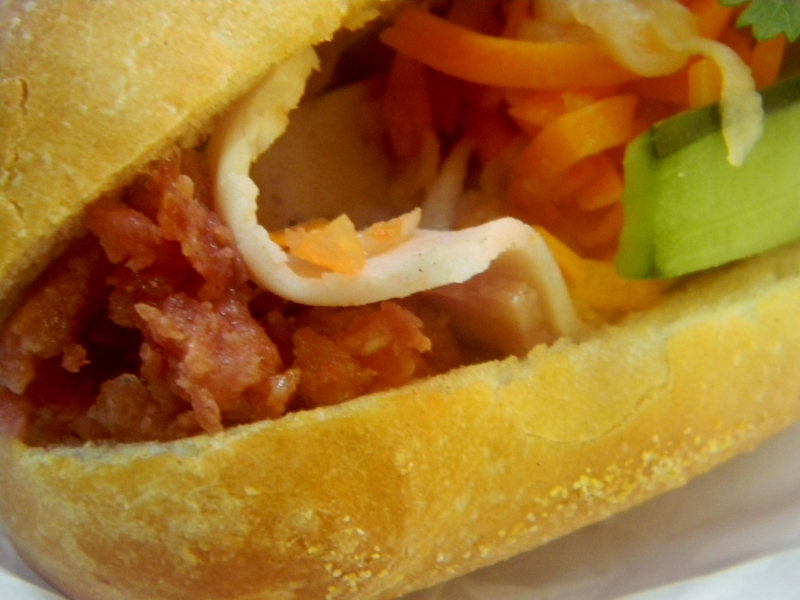 How do I know the #1 at Bánh Mì Saigon is the best? I can’t explain it, it’s just something I knew when I ate the sandwich. I was made privy to a clarity, and what the sandwich at Saigon Vietnamese Sandwich Deli suggested was not that that picture had shifted, but that perhaps my eyes did not work as well as I thought they did. Given that I can rely only on myself, my impressions and my understandings, to share the things I love with you, that notion is uncomfortable. Consider the tapestry that is the idea of “Best.” How difficult it is to see which thread is quality, which thread is context, which is luck? Is there novelty in the weave? Bias? This problem exists across criticism, and it prompts some to scurry in retreat, designating only a “favorite,” informing anyone who asks that they must make their own decisions. I would consider that an option of last resort, and it’s not one I will avail myself of today. No. Today I will tell you that this is the second best bánh mì I’ve ever had, that it is slightly too moist, and too tender. It is an exceedingly good sandwich, really, genuinely, very very good. But it was not as good as what I’ve had from Bánh Mì Saigon. This entry was posted in A Month of Bánh Mì, Sandwich Reviews and tagged Banh Mi, New York, Pork, Reviews by Pete, Sandwiches I Have Eaten, Sandwiches Made For Me by Pete. Bookmark the permalink. I’m always leery of the word “best” when describe food or restaurants. Sandwiches, like any art, are open to interpretation and one’s own baggage and history come into play when examining the parts that make up the whole. That does look like a mighty fine sandwich. I like the idea of the mince. I understand your hesitation, and you make a valid point. That said, I think refusing to declare a best does the things we love a disservice, or runs the risk of doing so. Consider that which stirs your heart to the extent that you feel it must be the best, be it food, art, whatever. To admit that it might not be the best is to grant criticisms ground to stand on, claiming disagreeance yet maintaining a certain respect. I cannot do that. I recognize that this is not a reasonable position, but so be it. Better I stand, nakedly ridiculous, holding up a pedestal of my own construction than to leave the things I love mired in the morass of “among the best.” Again, I understand any reluctance to declare a unilateral best, but I find myself unwilling to doubt the conclusions of my own heart. Maybe it’s my own hesitation that holds me back from declaring best. Doubts about my own authenticity or lack of authoritative stance. While I consider myself a smart and traveled person, I do not believe I have the expertise to ever say I know enough to say anything is the best. Better, yes. Best, no. But that is me, and that is not you. Everyone has to judge each critic by their own merits. I would trust your best in banh mi sandwiches as you have had far, far more of them than I have.